Last week's geology camp yielded a number of good fossil finds at Lilydale Regional Park in St. Paul, MN. Today's example is a trace fossil and it is a new one for my collection. If you look at this piece of rock you can see small circular imprints and other marks. When I picked up the rock in the field I could see perhaps four of these impressions. The only ones I could see were the four starting on the left. When I took the piece home and cleaned off a thin layer of shale mud I found there are more like 29 impressions in the rock as well as some really fine drag marks visible in the upper left. The more I look at it, I think the area on the far right was a burrowing or resting spot. When I look with my 10x triplet loupe I can see that the impressions immediately to the left of the far right area look more scratch-like as though something had to apply more pressure to crawl up and out of the depression. Instead of being round holes as the other ones are they are more elongated. 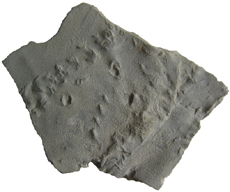 This trace fossil is an example of a repichnia or a fossilized trackway from a walking or crawling creature. My best guess is that it is from a small trilobite, perhaps Eomonorachus intermedius or a similarly small sized trilobite. 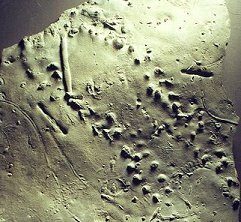 Here are some examples of other trilobite trackways.